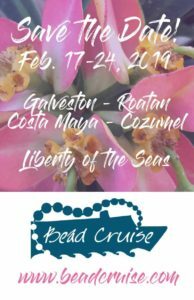 Last week, the editors of the Art Bead Scene Studio, along with some of our beadmaker friends, hosted a trunk show on the Art Bead Scene Lounge group on Facebook. If you missed it, then you missed out on so many fabulous beads and charms and toggles and pendants in all sorts of styles that suited either the September or upcoming October challenges. But don’t worry. We plan to do it again! I really wanted to do something for both, but I have a curious habit of biting off more than I can chew, and also underestimating the time it takes me to make some things. But I knew that I needed this push and there is nothing quite like a looming deadline to light a fire under you and spark your creativity! So I used the September monthly challenge of the insect illustrations of E.A. Seguy as my inspiration and made as much as I could in a very short time frame – no rest for me on Labor Day weekend! 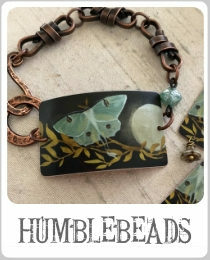 Now the prints that were selected for this month all have wings in them, dragonfly or butterfly. But the color palette was one that I was not that enamored of….so I set out to find more of E.A. Seguy’s work. This guy was prolific! 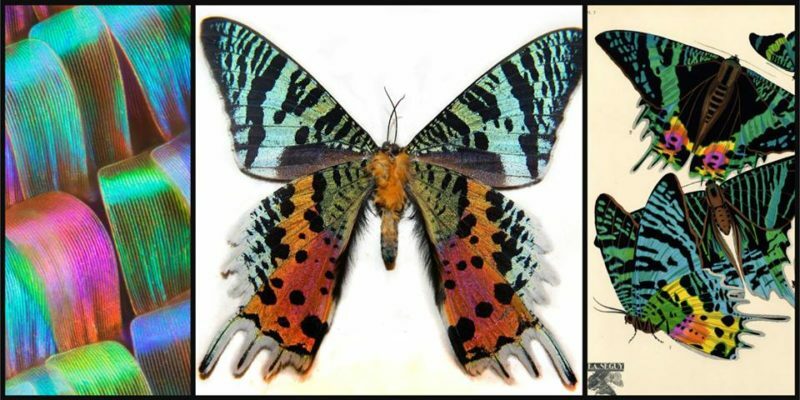 He was an etymologist by trade, but he turned that love of bugs into precise and realistic assemblages of butterflies, dragonflies, beetles and other winged things in a series of seven illustrated folios. And to further this artistic presentation, he also turned the patterns of the insects into pochoir prints using a stenciling technique to lay down bright layers of color by hand. So I took the artist Seguy as the inspiration, but found so many more to pique my interest and inform my color choices, like this bright pattern below. 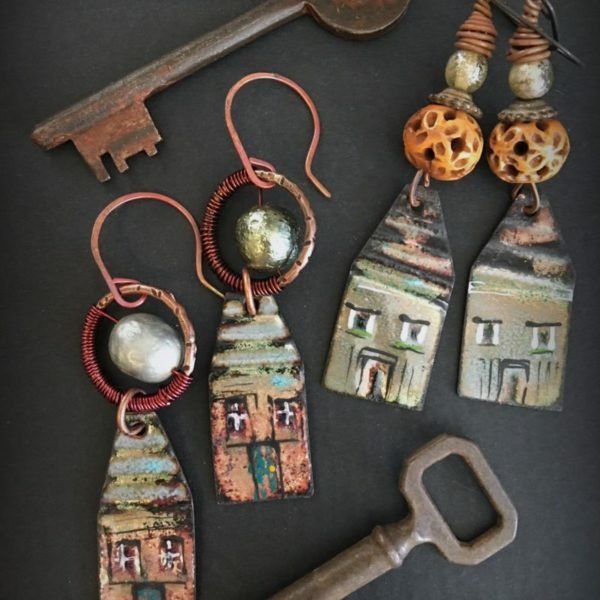 One of the things that I always pledge with my Simple Truths Sampler Club is that wherever possible, I will try to teach myself something new in polymer clay. This month, I thought it would be a perfect fit for the bargello technique. This technique is part of embroidery traditions from Italy, where alternating stitches produce a pattern that has a chevron, or flame, appearance. Quilters have adapted that technique, as well as clayers. But I took it one step further and started down the rabbit hole of macro photography of insect wings. 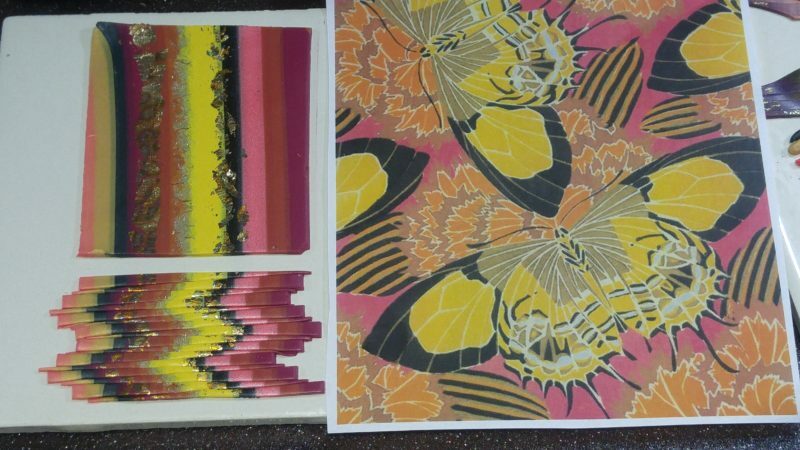 from l to r: macro photo of butterfly wing; Madagascan Sunset Moth; E.A. Seguy’s depiction of the same. The patterns (like in the left picture above) revealed in 7-, 16- or even 20-times magnification mimic the markings of the bargello pattern or a mosaic. And that was my “eureka” moment! 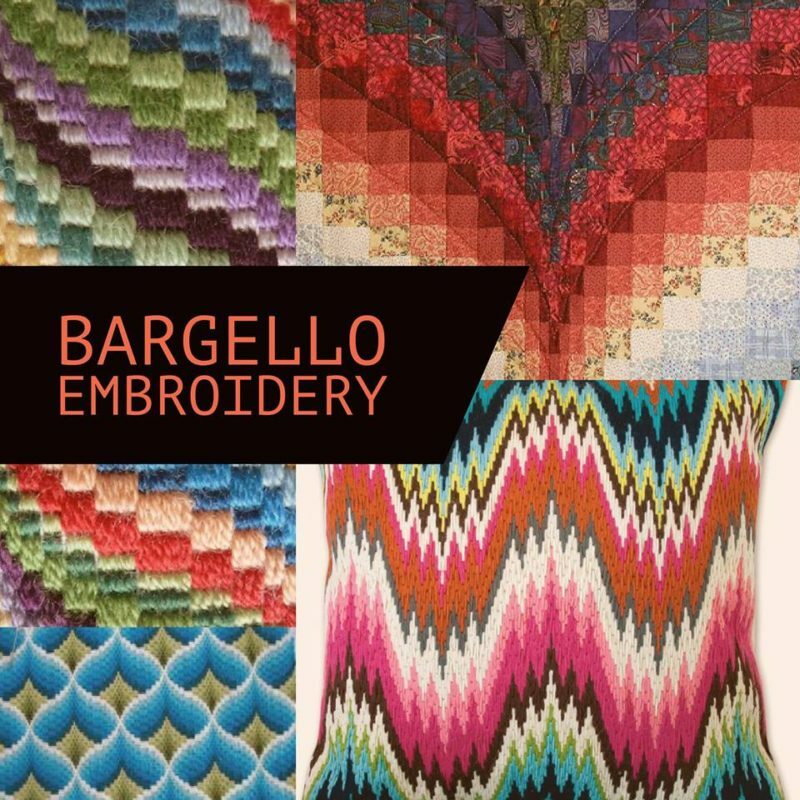 Clayers make the bargello pattern by taking a sheet of clay that is typically striped, slicing thin strips and staggering the strips, like assembling a jigsaw puzzle. 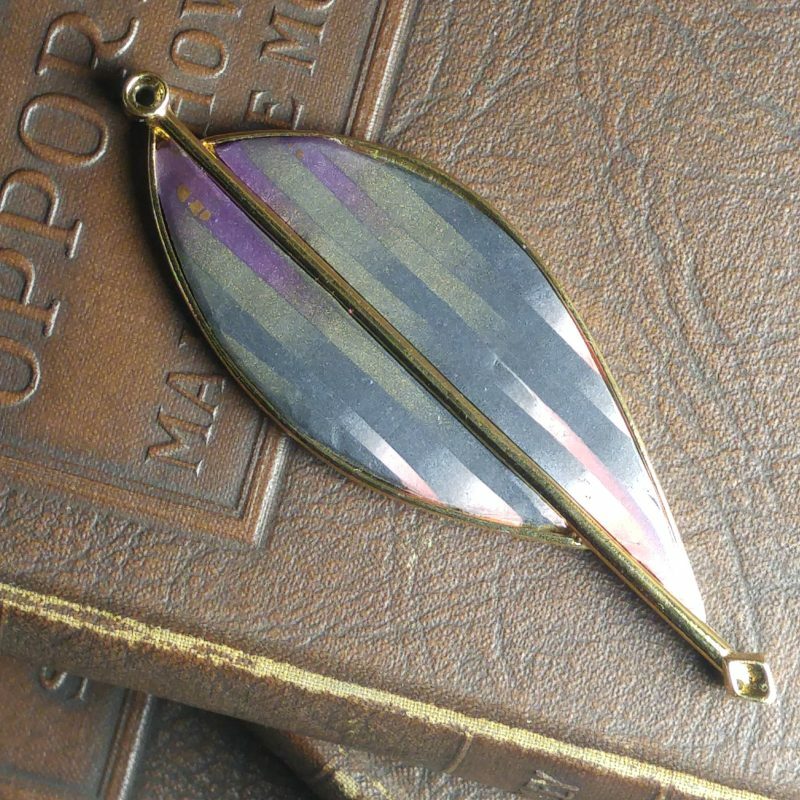 The result is that recognizable chevron pattern that is a hallmark of this style. Many of the prints I liked had very vibrant colors. 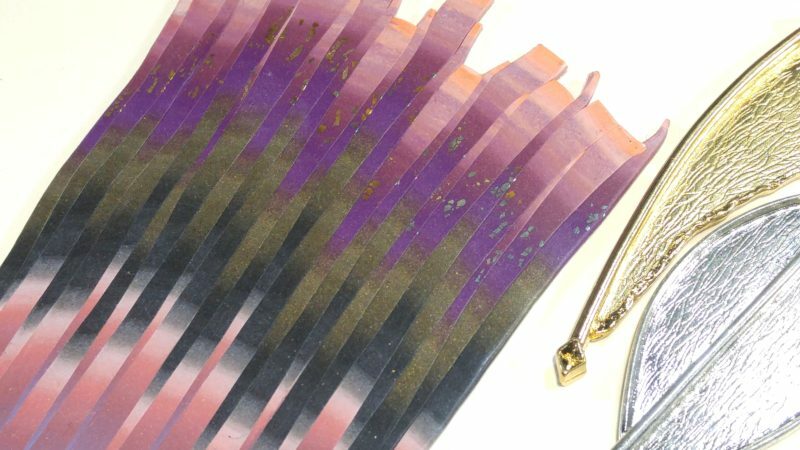 I translated those colors into strips of clay, adding in a little glitter clay, pearl clay or even layering on variegated gold leaf, just to add some interest. Each distinct color palette I created netted me with about the size of an index card of clay veneer that I could apply to various bezels – so not very much. I used as much of the veneers as I could, alternating with the sizes and shapes of the bezels (I have a very large assortment of bezels! ), and the rest I fabricated into abstractly colored barrel beads. Nothing ever goes to waste! There where four different colorways that I made for the trunk show, and then I decided to make just one more, for the Club members, as an exclusive. I only had enough of this limited veneer to make three wing shaped pendants, plus one more for me. So I dipped into my vintage feather/wing bezels because I wanted it to be truly unique. Do you see the inspiration palette that I had in mind? I love that large moth at the top, with the pale green center and the dusty purple outer edges. The one that I saved for myself is a different shape, but the same palette, but you can see how the pattern changes given the shape of the bezel and my placement on the veneer. 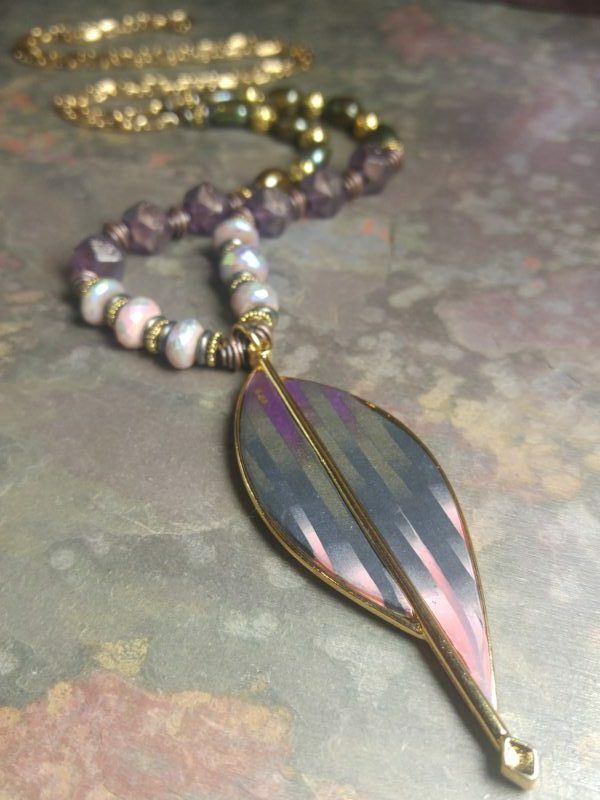 I decided to make a long necklace befitting the size of this substantial pendant and interspersing gold accents with olive green freshwater pearls, amethyst English-cut Czech glass beads in a luster finish, and opal faceted rondelles in an AB coating. 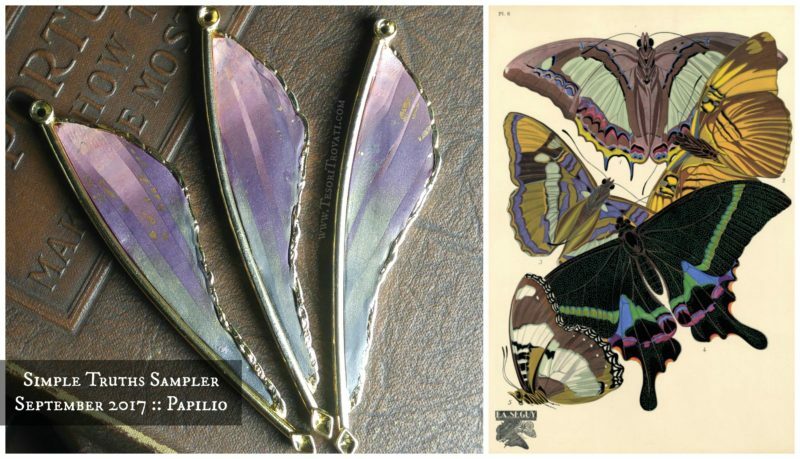 I called all the pieces I made for the trunk show Papilio, which is Latin for butterfly. The trunk show was a fabulous time. I have never done anything like that before, and I felt good that it was among my Art Bead Scene friends. We are already busy planning the next trunk show and ways to make it even better for our readers. And I have also thought of hosting my own trunk shows and a few months ago I set up a Facebook page to house that. I don’t have anything planned now, but if you are so inclined, please feel free to sign up to join me for when I do kick it off! You can join my new group at Treasures Found with Tesori Trovati where I hope to offer trunk shows, destashes and more in the coming months. 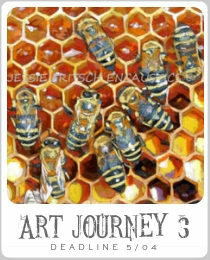 Thanks for joining me on my art bead evolution! 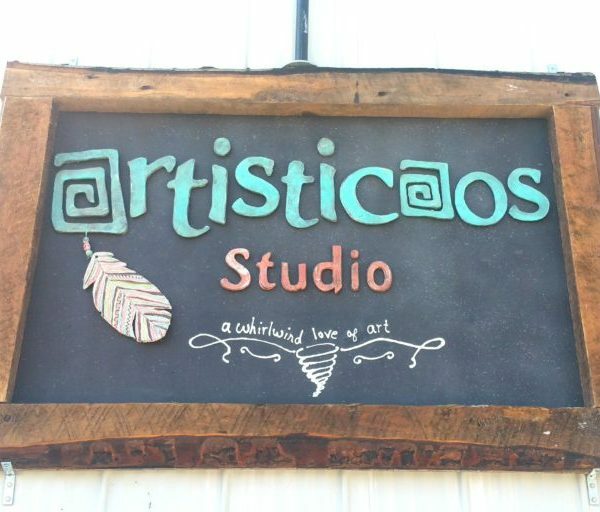 Inside the studio (and outside) with artisticaos. The Earring Whisperer: Love Shack, Tin Roof, Russsssted! You I’m so inspired by this, Erin!!! Absolutely brilliant idea! Those are beautiful. I love your thought of learning something new. Great way to inspire and give yourself permission to play and discover. 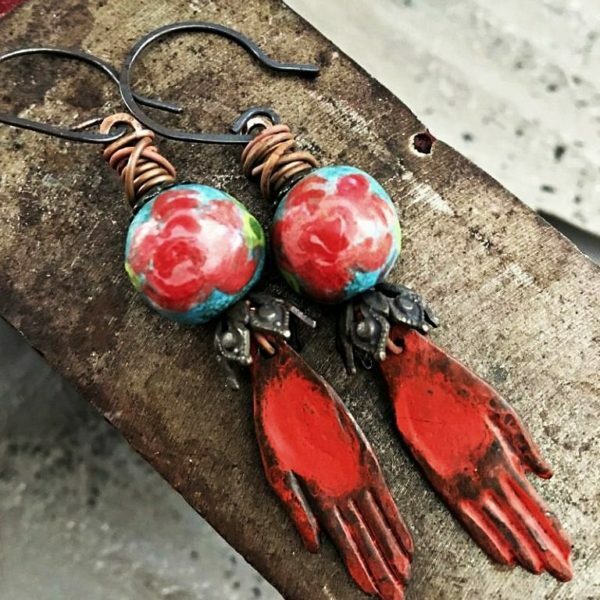 I love your inspiration for these pieces and how they turned out – so very beautiful and unique.